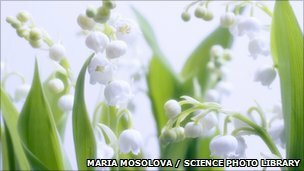 Cornish Lilies of the Valley will feature in the Royal Wedding on Friday. The flowers, from Ferndale Farm near Illogan, were ordered months ago but the grower Clive Simmons said he had only just discovered the royal link. He said he was looking forward to the flowers being on show during the televised ceremony. It is not known if the small white flowers will be used for buttonholes or bouquets at the wedding of Prince William and Kate Middleton. Mr Simmons said he suspected there might be a royal connection when the order was placed. "Then the wholesaler rang me and did say then that the valley was destined for the Royal Wedding. So I am looking forward to perhaps seeing a bit of it on show on the special day." The flower is a famous feature of Flora Day which takes place each May in Helston. People travel from all over the world to see it. Carol Simmons bunches the flowers, and says the royal order was quite specific. "We had to have a special length for this order. We're very modern down here. "We use a flower pot as a measurer, six to eight inches in length." The Simmons family has been growing Lily in the Valley at their Cornish farm since 1940. A centuries-old causeway which was smashed by storms in 2014 is restored using the original granite setts.